JustAnswer.com is a website where users can ask experts for advice and receive answers to many types of questions. 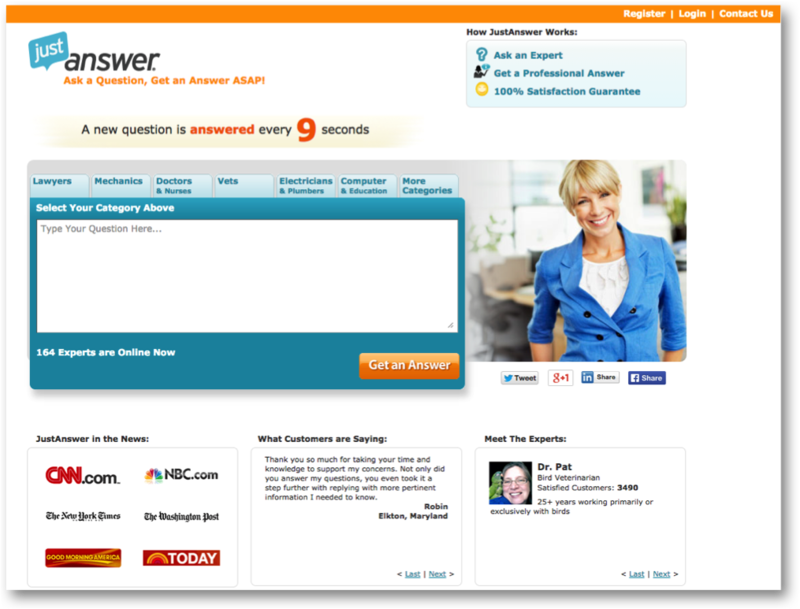 As a result of this business model, JustAnswer.com built a complex fulfillment system that was used to track the initial question submitted, the initial deposit a customer makes, and additional paths used to track the interaction with the designated expert answering the users question. A heavily trafficked site, with a question being answered every 9 seconds, JustAnswer.com needed a detailed tracking strategy and analytics implementation that could provide them with the flexibility to track and report on the multiple elements and user paths presented to each visitor. They recognized the need to understand customer interactivity for a wide variety of audiences. To meet their specific needs, Just Answer partnered with Blast Analytics & Marketing to devise a customized analytics tracking strategy using Google Analytics Premium. 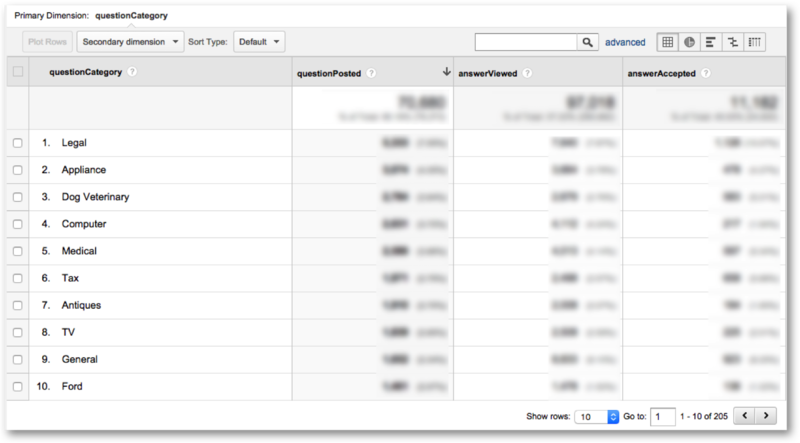 One key feature that made Google Analytics Premium the ideal choice, and critical to the success of JustAnswer, is the availability of 200 custom dimensions and metrics. With an intricate fulfillment platform and significant custom measurement opportunities, Just Answer needed robust custom tracking capabilities. Blast and Just Answer architected and implemented a strategy that utilized multiple Custom Dimensions and Custom Metrics to help better identify and understand visitor behavior. This ultimately shaped the user experience while providing detailed insight into the customer journey. Dimensions were created and scoped at the three different levels: Hit, Session, and User levels. and Question Number (User Level) to begin to get a sense of customer retention and repeat visit value. Custom Metrics were also developed and used to track on-page interactivity where the customer has the ability to select the level of detail needed or urgency of the question. By using custom dimensions and metrics to meet Just Answer’s business reporting needs, Blast enabled key measurement points to support detailed funnel reports, key performance trends by question, category, and source, plus improved attribution modeling. Through Google Analytics Premium and a customized strategy, JustAnswer is able to collect, process, and analyze the site’s performance data in ways previously impossible, gaining valuable insight and taking action on their data to drive site improvements for all of its users.